In consideration of their origin the adaptive strategies of the evergreen species of the Mediterranean maquis were analysed. 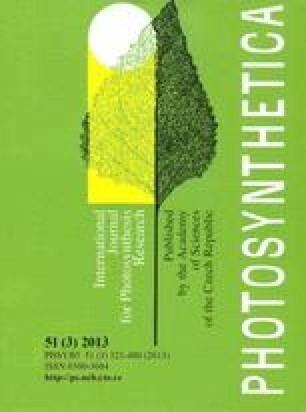 Rosmarinus officinalis L., Erica arborea L., and Erica multiflora L. had the lowest net photosynthetic rate (PN) in the favourable period [7.8±0.6 μmol(CO2) m−2s−1, mean value], the highest PN decrease (on an average 86 % of the maximum) but the highest recovery capacity (>70 % of the maximum) at the first rainfall in September. Cistus incanus L. and Arbutus unedo L. had the highest PN during the favourable period [15.5±5.2 μmol(CO2) m−2s−1, mean value], 79 % decrease during drought, and a lower recovery capacity (on an average 54 %). Quercus ilex L., Phillyrea latifolia L., and Pistacia lentiscus L. had an intermediate PN in the favourable period [9.2±1.3 μmol(CO2) m−2s−1, mean value], a lower reduction during drought (on an average 63 %), and a range from 62 % (Q. ilex and P. latifolia) to 39 % (P. lentiscus) of recovery capacity. The Mediterranean species had higher decrease in PN and stomatal conductance during drought and a higher recovery capacity than the pre-Mediterranean species. Among the pre-Mediterranean species, P. latifoliahad the best adaptation to long drought periods also by its higher leaf mass per area (LMA) which lowered leaf temperature thus decreasing transpiration rate during drought. Moreover, its leaf longevity determined a more stable leaf biomass during the year. Among the Mediteranean species, R. officinalis was the best adapted species to short drought periods by its ability to rapidly recover. Nevertheless, R. officinalis had the lowest tolerance to high temperatures by its PN dropping below half its maximum value when leaf temperature was over 33.6°C. R. officinalismay be used as a bioindicator species of global change. This revised version was published online in March 2005 with corrections to the page numbers.